While buying a material for your kitchen countertop you ought to take into considerations numerous factors such as strength, durability as well as ease of maintenance. Once marble was considered to be the best material for kitchen countertops; however, over the years numerous other materials have been put to use. Today we tell you about 6 popular materials for your kitchen countertop which will give a new makeover to the same. One of the best materials you can buy for your kitchen countertops is poured concrete. Aside from giving a rough look at the kitchen, it comes with an added strength. One of the best features of this material is the enhancement in appearance which it sees overtime. Generally, other countertop materials begin losing their gloss and shine, however, poured concrete if sealed property doesn’t get stained and begins to shine as the time passes by. You can mold and color this material according to your choice and it is easy to maintain as it can be cleaned with a single mop of dry or wet cloth. Granite is the symbol of elegance. For those who aren’t facing any budget constraints, granite is the material which you should buy for your kitchen. This material comes in almost 3000 variants and can withstand temperatures up to 300 degrees Celsius. Granite is one of the hardest materials present on Earth and once installed, can probably last a lifetime. The only care you have to take is to make sure no excess pressure is applied or no object falls on it, because this material may develop cracks which will demand a complete replacement. As we mentioned before the trends as changing and so are the people’s preferences. 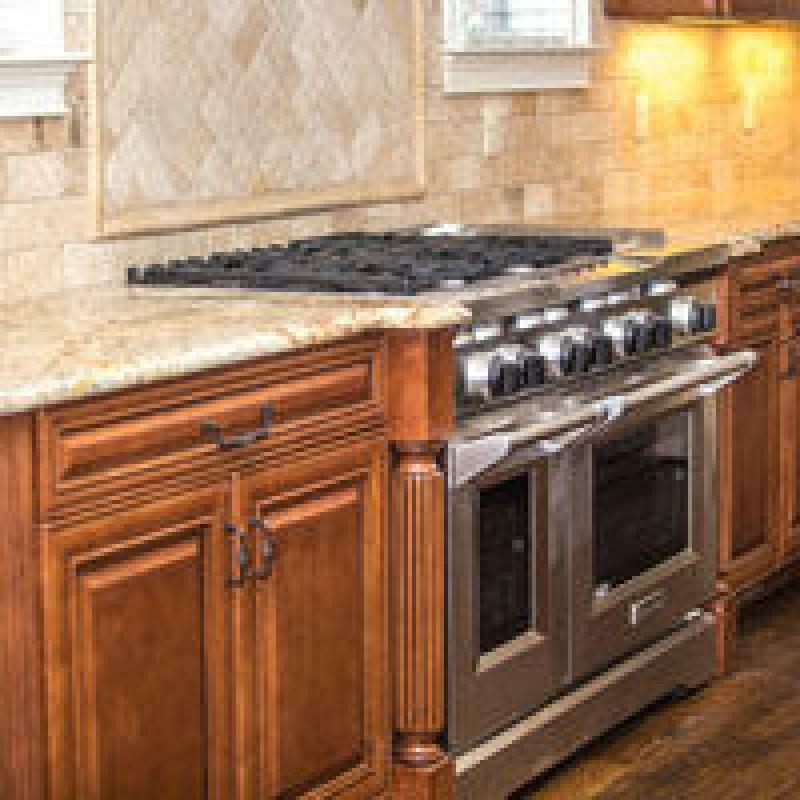 Reclaimed wood is one of the hottest kitchen countertop material options present in the market. For those who don’t know what a reclaimed wood is; it is a wood which is obtained from the old homes and barns and then utilized for different purposes. Reclaimed wood has strength, is cheap, looks stylish and does give your kitchen a brand-new look. Adding to that it helps you recycle and reuse the material, thereby making Earth greener. If you are looking for something other than granite than engineered stone is the material you should go for. Engineered stone offers the same level of strength as granite, however, comes in more variants than same. It is engineered to be non-porous and can even withstand acid without being burned by same. This material through a bit expensive is a trend which most people are following in the Southeast and Middle East regions. Similar to reclaimed wood, butcher block also offers an added elegance to the kitchen. This material is soft as well as environmentally friendly, and is a trend which many people are following. This material, however, isn’t for people who prefer chopping, cutting to be done on the countertop, for that, you ought to buy a separate chopping board. Aside from that this material is easy to maintain. Only care you should be taking is to avoid excess water spillage over the surface, because the water may seep in and damage the wood from within. One of the newest trends which people are following is using ceramic tiles as kitchen countertops. These tiles are easy to apply, are inexpensive as well as come in a variety of options for you to try. The only disadvantage you will find with these tiles is the uneven surface which you get, aside from that these are easy to maintain as well as if cleaned regularly will last for a decade or even more. These 6 materials are currently in trend and are used by numerous homeowners for their kitchen countertops. What material are you using for your countertop, do let us know in the comment section below.